In his 1973 book, Small is Beautiful: Economics as if People Mattered, E.F. Schumacher challenges our economic assumptions that more is better and bigger is more efficient. It has now been 42 years since Schumacher wrote his book and while there’s increased awareness of some of the issues he raised – inequality and environmental degradation among them – there seems to be no indication that these trends are going to reverse themselves anytime soon. To say that there’s still plenty of work to do is an understatement. Fortunately, there are some amazing people leading the way. While in Connecticut visiting my family for the Christmas holiday, we took an economic pilgrimage to the nearby Schumacher Center for a New Economics located in the Berkshire Mountains. This small retreat holds E.F. Schumacher’s personal library and has become a center of thought and innovation in the development of great local economies. Their annual speaker series list reads like a who’s who of local economic thinkers: everyone from Wendell Berry and Jane Jacobs to, more recently, Otto Scharmer and Van Jones. All of these great minds weigh in on the question “what does a new and better version of our economy look like and how do we make it happen”. Thanks to their phenomenal librarian, Amelia Holmes, all these lectures are online, along with an amazingly comprehensive reading list that is going to keep me occupied for years to come. 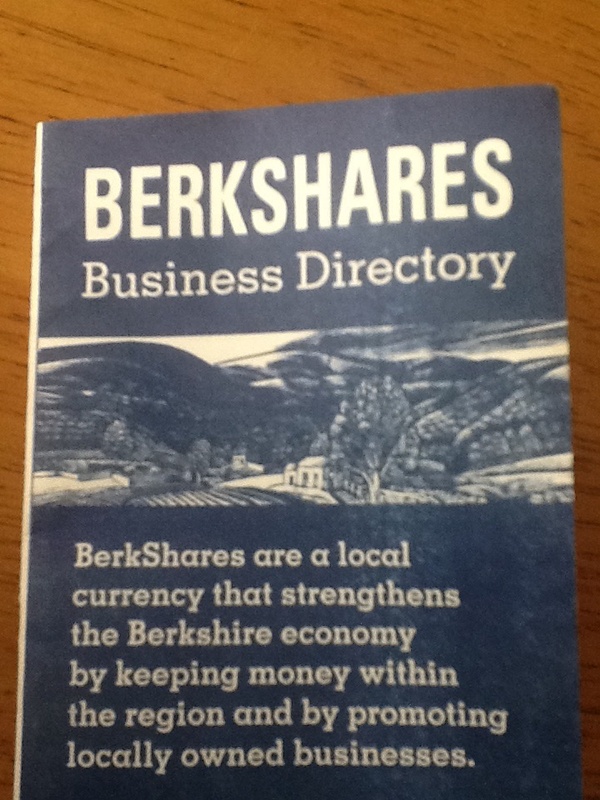 Developing America’s most successful local currency (Berkshares) and providing resources for other communities looking to start their own currency. Pioneering the concept of community land trusts, applying it from farmland to residential neighborhoods. This approach provides a means of providing permanently affordable housing as land value is not subject to market speculation. One example of such a trust is Indian Line Farm, which provides small-scale farmers access to affordable farmland. Indian Line was the first Community Supported Agriculture Farm in North America. Initiating a community conversation on how to develop local capacity and strategizing the replacement of imported goods with local goods. As part of this effort, the Schumacher Center is developing an open-source library of regionally-scaled manufacturing companies’ business plans and financial statements in the categories of food, clothing, shelter, energy, and transportation. Most exciting perhaps are the real-life results of these local economic experiments. Great Barrington, Massachusetts, home of the Schumacher Center and its economic guinea pig, seems to be an anomaly in a nation of struggling small towns. It is several hours from the major metropolitan centers of Boston and New York and boasts a population of a mere 6,800, yet it leads the way in arts and culture, featuring a “foodie” culture and an international film festival. In fact, Smithsonian Magazine named Great Barrington the best small town in America in 2012. On our way home from the Center, after nearly two hours of conversation with Alice Maggio, Director of Berkshares, and Amelia Holmes, the Center’s Librarian, I couldn’t help but feel excited. By clumsily following my own passion for local economics I had been led on a journey to the Massachusetts mountainside to find the small stronghold leading the way in this work. The active cultivation of a deep intellectual tradition combined with the implementation of that tradition at a local level reminded me of another period in our history. It made me think of St. Benedict, whose similar approach to Christianity in the mountains of Subiacco, Italy during the 5th century preserved the faith and intellectual tradition through the Dark Ages, ready for rebirth at the dawn of the Renaissance. In a similar way, if we are to overcome the dark storm clouds of our current economic system as identified by E.F. Schumacher, I have a feeling that leadership will come from a secluded little Center deep in the Berkshires. This entry was posted in Local Economy and tagged berkshares, community land trusts, local currency, schumacher center for new economics, small is beautiful, small towns, st. benedict by Justin Golbabai. Bookmark the permalink.